Naruto Uzumaki wants to be the best ninja in the land. 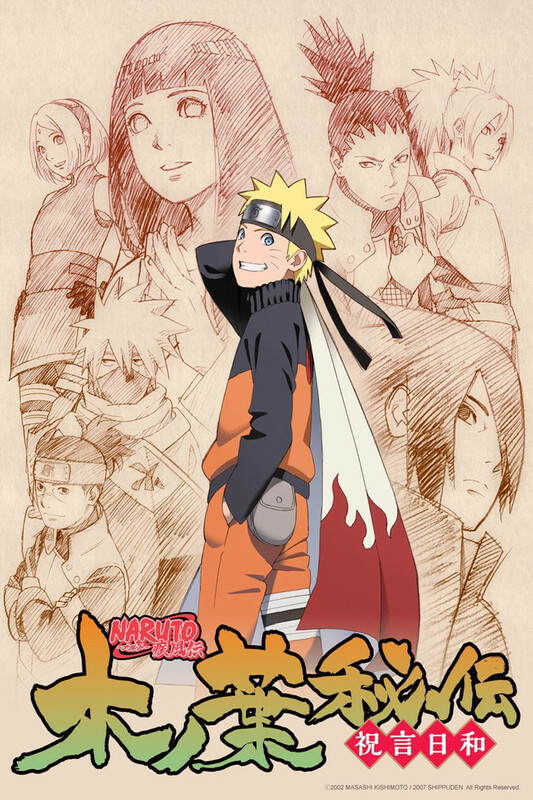 He's done well so far, but with the looming danger posed by the mysterious Akatsuki organization, Naruto knows he must train harder than ever and leaves his village for intense exercises that will push him to his limits. Two and a half years later, Naruto returns to find that everyone’s been promoted up the ninja ranks—except him. Sakura’s a medic ninja, Gaara’s advanced to Kazekage, and Kakashi…well, he’s the same. But pride isn’t becoming of a ninja, especially when Naruto realizes that Sasuke never returned from his search for Orochimaru. Plus, the mysterious Akatsuki organization is still an ever-present danger. As Naruto finds out more about the Akatsuki’s goals, he realizes that nothing in his universe is as it seems. Naruto is finding that he’s older, but will he prove wiser or stronger? Naruto Uzumaki voiced by Junko Takeuchi After two and a half years of intense training, renowned prankster Naruto returns to the Hidden Leaf Village with more power and stamina than ever. He still dreams of becoming the next Hokage, but his goal is getting side-tracked by his old comrade Sasuke, who he needs to rescue from the clutches of Orochimaru. But first, Naruto will have to face the Akatsuki, a powerful new group that's targeting the Nine-Tail Fox Spirit inside of Naruto. Through his training with Jiraiya, Naruto has acquired the means to control the Nine-Tail Fox Spirit, although it is not nearly as easy as it sounds. For the power of Nine Tail is too devastating, he swears never to rely on it again, and trust his own chakra instead. Aside from his strength, Naruto has the peculiar power to befriend anyone. Easing up characters like Gaara and Sasuke, and connecting people and villages despite their past, Naruto has established a formidable network of friends and comrades that can confront any obstacles. Sasuke Uchiha voiced by Noriaki Sugiyama The dark and narrow path he crawls, just like the "snake" that he once proclaimed himself to be, has finally led Sasuke to accomplish his revenge, only to discover the tragic truth. Now the snake has risen like a young hawk, high up in the sky. With the omnipotent eyes his clan endowed, he sets upon his next path, despite knowing that it will be bloodier than his previous one. While training under Orochimaru to gain more power to avenge his brother, he quickly enhances his strength, with the help of the Uchiha intellect that runs in his blood. Although Orochimaru was planning to take over his body, Sasuke kills Orochimaru, absorbing much of his abilities. With the power of Shirohebi (white snake), the Mangekyo Sharingan he succeeded from his brother, his intuition and godspeed, he has become one of the most formidable ninjas. Sakura Haruno voiced by Chie Nakamura Naruto's long time teammate, this Kunoichi has honed her skill as an expert medical ninja, thanks to Tsunade. She gained confidence that made her even stronger mentally. Meanwhile, she polishes her taijutsu to become strong physically. Medical ninjutsu is known to be extremely difficult to acquire, but with her natural talent and guts, she learned it astonishingly fast, and has became one of the leading medical ninja in the village. Sakura's exquisite control of chakra has also given her power to even crush a rock with her hands. Her earnest hope to recover Sasuke one day, has motivated her rapid growth as a Kunoichi. Kakashi Hatake voiced by Kazuhiko Inoue With his skills and smarts, Kakashi is the elite of the elite ninja and the pride of the Hidden Leaf Village. He hides a tough past behind his cool demeanor and his powerful Sharingan, with which he's copied over 1,000 ninja jutsu, has earned him the title, "Copy Ninja." Once Naruto and Sakura's teacher, Kakashi has come to view his former students as trusted teammates. While how he acquired Sharingan is kept secret, he actively and lavishly teaches his students jutsu he copied. As one of the most relied Jonin in the village, he feels it’s his duty to facilitate the growth of the younger generation in every way. Jiraiya voiced by Houchu Ohtsuka Despite his endless list of achievements--one of the legendary Sannin (Three Ninja), teacher for the Fourth Hokage, Naruto's trainer during his time away from the Hidden Leaf Village--Jiraiya is a modest ninja. Taking his personal philosophies from his personal experiences, Jiraiya keeps his stories close to himself. After training Naruto for two and a half years, Jiraiya finally returns home. His next mission was to track down Orochimaru, once a comrade from his days as a Sannin. After hearing of Orochimaru's sudden death, he confronts the new enemy, the Akatsuki, only to discover that the core members happened to be his former students. Yamato voiced by Rikiya Koyama A master of the Secret Wood Style Jutsu, Yamato was selected to be the leader of Team Kakashi in Kakashi's absence by Tsunade, the Fifth Hokage. Itachi Uchiha voiced by Hideo Ishikawa Growing up as the child prodigy of the Uchiha clan, his much envied genius has made him a double agent between the village and his clan. Knowing that the war was inevitable between the two, he chose to kill his entire clan, out of his desperate hope for peace. As a shinobi, Itachi was too kind, and his fate was just too ironic for his kindness. Even after Itachi left the Hidden Leaf Village, he has never stopped caring about his village, and his brother, Sasuke. Therefore, his real intention of joining the Akatsuki is so that he can monitor their activities. The final battle with Sasuke gave him the chance to finally clear up his brother's misunderstanding, as well as initiating him the Mangekyo Sharingan. With these mementos, Itachi entrusted everything to his little brother. Madara Uchiha voiced by Naoya Uchida People judged Madara Uchiha as a man who robbed his brother's Sharingan in order to maintain his own. No one understood his desire to defend the future of his clan. In despair and anger, Madara antagonized the Hidden Leaf Valley. After losing the battle against Hashirama, no one knows where he was led to. Pain voiced by Kenyuu Horuichi He is the leader of the Akatsuki, the criminal organization in search for Tailed Beasts. The hint to his enigmatic identity is the Rinnegan appearing in his pupil. Proclaiming that "pain" has given him the power, he leads Akatsuki with his divine charisma and invulnerable strength. Not much is known about the Rinnegan, and its correlation to Pain's abilities, such as the six bodies of Pain sharing one consciousness, which is called the Six Paths of Pain. They are immortal, with each having unique abilities and black swords that disrupt chakra. His scheme started from the revolt in the Hidden Rain Village a few years ago, where he extinguished the entire clan of the legendary ninja, Hanzo. With Akatsuki under his command, his goal is to collect all Tailed Beasts and create an ultimate weapon which he believes will bring an end to all wars. Neji Hyuga voiced by Kouichi Toochika The most talented ninja in the Hyuga clan, Neji once objected to his status since he was born into a cadet family. With the support of his clan, Neji got over his resistance and now follows the village's morals and works hard as a jonin. Rock Lee voiced by Yoichi Masukawa After the rejection of his other talents, and to ensure his survival as a ninja, Rock Lee became an expert in taijutsu. Although he has suffered some setbacks, Rock Lee has a strong desire to achieve more and commits himself to the tough training and lessons of his master, Might Guy. Shizune voiced by Keiko Nemoto One of the Hidden Leaf Village's top Medical Ninja, Shizune is also the Fifth Hokage's loyal right-hand woman. Familiar with Tsunade's personality, Shizune provides devoted support. Tenten voiced by Yukari Tamura A ninja is only as good as her weapons, so Tenten works tirelessly to care for hers. With so many different types and countless ways of using them, Tenten's weapon attacks help give her team a flawless fighting style. But her talent isn't her only team contribution: Tenten is also known for her solid reasoning and opinions. Tsunade voiced by Masako Katsuki As the first female Hokage in the history of the Hidden Leaf Village, Tsunade is one of the influential and legendary Sannin (Three Ninja). One of the founders of the medical ninja field, Tsunade has a great love for the village and its people. Despite losing veteran ninja such as Asuma and Jiraiya against the Akatsuki, her will to defend the village has never waned. Konan voiced by Atsuko Tanaka In the Hidden Rain Village, people call her an "angel", as she serves Pain, their god. No longer possessing the kind heart she once had as a student of Jiraiya, she continues to follow Pain's orders loyally, and mercilessly. As a little girl who loved origami, Konan's hallmark ability is to transform her body into layers of papers. The true reason why she decided to choose her bloody path is hidden behind the deadly dance of her confetti.